It is not lost on Ryan Reynolds that the best trick that “Deadpool” had under its sleeve was the element of surprise, and that that is gone now. He’s admitted that he’s not sure if he has a third “Deadpool” movie in him, and personally, I think he should listen to that voice. 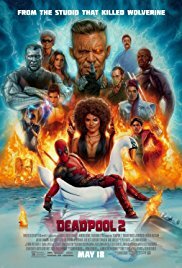 That is not a commentary on the quality of “Deadpool 2,” for the record. It’s as entertaining as the original film, and arguably funnier. The story structure, though, is a bit too close to a certain Rian Johnson film, and more importantly, how far can you take this joke before it runs out of gas? As it is, these films are a couple of bad jokes away from being parodies (“Meet the Supers”?). Indeed, if the closing credit jokes are any indication, Reynolds has already cashed in his chips, and plans to go out on top right here and now. Those who played along when I ran Popdose’s “Name That Tune” roughly a decade ago (*pauses, kneels over, takes a breath when he contemplates that those days were nearly a decade ago*) may see similarities with some of these theme shows that I’ve been doing lately. Yep, I’m recycling, but hey, it’s been ten years or so. I’d like to think that the statute of limitations has long since expired. Much like the previous shows, I now have at least two more shows’ worth of ____ and ____ material already at my disposal, thanks to my awesome (read: much more knowledgeable) Facebook friends. I am not afraid to admit that the themed shows are better because my friends’ song suggestions are better than mine. Many of the artists making their Dizzy Heights debuts this week, well, embarrass me, because they should have been played weeks/months ago. See if you can guess which ones I’m talking about: Adam & the Ants, Capital Cities, Death Cab for Cutie, Elle King, Joan Jett, John Mellencamp, The Ramones, Voice of the Beehive, Walter Egan, and XTC. That’s right – nearly all of them.